If you are interested in big cats in Australia then you cannot go past any copies you can find, especially online, of this classic. 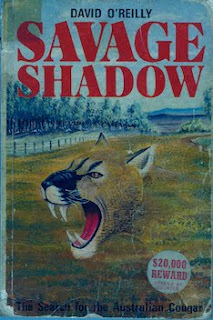 The Journalist David O`Reilly wrote this gripping saga in the 1970`s about the west australian big cats and the clashes between the farmers and public servants. Regarding killed farm animals, Govt vets said words to the effect of "dog predation"..private vets said "never seen predation like this before..". The author witnessed the cats himself. Reads like a wild novel, but its all real. And the rumour mill is running red hot that there is a reprint of this classic book coming out soon, with NEW photos. Oh beating heart be still.